Prairieville, LA - K-TEK announced the LM80 laser transmitter for non-contact level measurement and positioning. Designed for a variety of applications, the LM80 measures position over very long ranges, at distances up to 500 feet (150 meters). The device also accurately measures level at distances up to 100 feet (30 meters). Whether handling plastics, coal, grain, or aggregates, the LM80 can measure any solid surface at any angle. The small wavelength of the laser means a narrower beam with virtually no beam divergence and, therefore, no false echoes. This provides high accuracy readings even when dealing with the most challenging circumstances, such as measuring into silo cones, even inside silo chutes and through narrow openings in protective grids. The LM80 can be installed on any existing silo nozzle, three inches or larger, regardless of location. The LM80 features an all-digital design that provides speed and accuracy in a compact unit. An advanced timing system and self-correcting signal processing functions allow the device to accurately and reliably make measurements in the harshest conditions. The system can select the true signal even in the presence of dust, as is commonly found in silos of coal, plastics, or grain, as well as in underground mines or quarries. 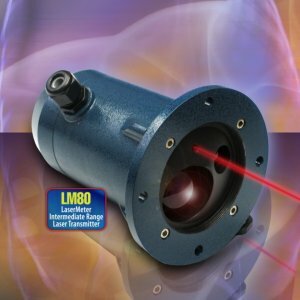 "This LM80 combines a number of advanced technologies into a single, unique, reasonably priced measurement device, going far beyond where other measurement technologies leave off," said Ivo Radanov, Product Manager for Lasers at K-TEK. "The laser provides unheard of flexibility and accuracy when compared with traditional level devices. Virtually any surface can be measured at any angle with pinpoint accuracy. No beam angle divergence means the transmitter can be narrowly focused over long distances without interference from its surroundings, such as internal structures. No false echoes and no reflections mean complete immunity to 'cone up,' 'cone down,' and angle of repose variations in the material being measured. The LM80 is being installed in hundreds of level or positioning applications. The unit is simple to install and use and is maintenance-free." The advanced signal processing software in the LM80 automatically compensates for color differences in the materials being measured. The device is able to easily distinguish between dark color surfaces such as coal, and light color surfaces such as plastic pellets and aggregates. The unit can also measure the position of moving targets over long distances, such as overhead cranes and tripper cars. Thus, one unit can handle both long distance positioning and level measurement applications at one-third the price of competitive models. The LM80 includes last pulse detection, which selects true signals from among the many that are reflected from dust clouds, agitator blades, or other obstacles. Variable gain allows the device to select the best return signal in quickly changing visibility conditions, such as dust, vapors, and materials of different colors. A built-in filtering system allows the unit to handle rapid level tracking applications, such as rock crushers or aggregate process hoppers, as well as slow moving levels, such as in inventory silos. The laser transmitter is housed in a powder coated aluminum enclosure, IP66 rated. It is FM certified for Class I Div 2 Group A,B,C,D and ATEX for Ex nA nC II T4. Dual internal compartments isolate the optical components from the wiring terminations, eliminating the possibility of moisture buildup and errant readings. Stainless steel dust tubes with built-in purge port prevent dust build-up and protect the optical lens from being coated. The LM80 is a compact, stand-alone unit that is quick to set up and install. It requires no calibration or special configuration. The unit is easily programmed with a compact handheld device. An optional laser pointer provides precise alignment. Portable mounting options allow users to position the laser in any direction.